The Richmond Greenway is located in the central portion of Richmond, CA, a highly urbanized city and major industrial and transportation center. Richmond, California is in the western-most portion of Contra Costa County, lying on a peninsula that separates the San Pablo Bay and the San Francisco Bay. 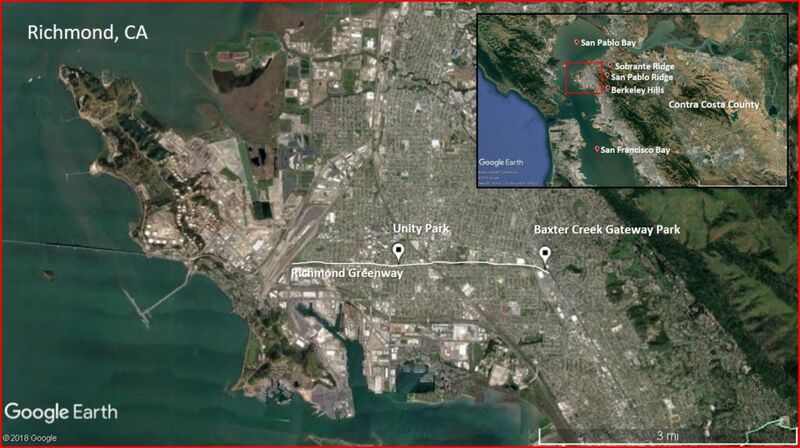 A series of creeks—which are part of the San Francisco Bay Watershed—empty into the bay from the Berkeley Hills, San Pablo Ridge, and Sobrante Ridge. The San Pablo Bay, San Francisco Bay, and several creeks in Richmond are listed on EPA’s 303d list of impaired waters. Additionally, air pollution is a significant problem with one in five children between the ages 1 and 17 diagnosed with asthma between 2009 and 2012. This health anomaly is twice the national average and disproportionately affects people of color in the Richmond area. Since 1900, Richmond has seen several episodes of industrialization and shifts in population growth. Today, the population of Richmond is almost 110,000; and it remains a center for industry and transportation, including the Chevron Richmond Refinery, American Textile and Supply Inc, two interstate freeways, two railroads, and Bay Area transit services. 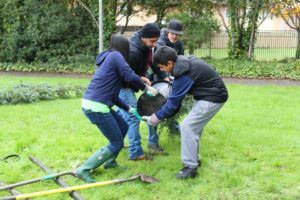 Because the area experiences high unemployment and crime rates, environmental issues, and health concerns, organizations and city agencies are working together to restore the urban landscape in Richmond to create a healthier, safer environment. In 2005, the City of Richmond created a bike path along a former railway corridor that became known as the Richmond Greenway. In 2011, the greenway was established as a public park. In 2012, the city was awarded a $5 million grant from California’s Proposition 84 Strategic Growth Council to create Unity Park – a central location on the Richmond Greenway that symbolizes the community’s collaborative efforts to green the city. Residents formed design teams and presented their plans to the community during a Community Design Feedback event. Plans included multi-faceted elements like playgrounds, art installations, different kinds of gardens, fruit tree orchards, and bioswales. In January 2018, Groundwork Richmond organized the grand opening of Unity Park, which coincided with the Martin Luther King Jr. Day of Service, where over 700 attendees planted trees, toured the new park construction, and participated in a Unity March. Beyond the greenway, Groundwork Richmond is working to restore Richmond’s urban forest by acting as the city’s Urban Forestry Administrator. In this role, they engage the community, plant trees and gardens, build green infrastructure elements, and track greenhouse gas sequestration. To date, the team has planted 1284 trees and installed multiple green spaces throughout Richmond. This work is also supported by funding from the California Coastal Conservancy in cooperation with the City of Richmond, the Trust for Public Land, and The Watershed Project. Groundwork Richmond also partnered with Richmond’s Urban Development Team and NASA DEVELOP to quantify changes in urban tree canopy cover and land surface temperature. Results of the study revealed that impervious surfaces increased 6% between 1985 and 2015, and land surface temperatures increased 6°F during the same period. The teams identified communities that lack tree cover and are vulnerable to high heat exposure, enabling Groundwork Richmond to target areas that will benefit from their urban forestry work in the future. Groundwork Richmond is not only providing programs that have a positive influence on the environment but also helping to educate local youth. Through its Green Team program, high school-aged youth gain work experience, recreational opportunities, networking, paid internships, and educational enrichment. The Green Corps offers jobs for graduates of the Green Team, providing further job experience and helping young adults to build their resumes. Both Green Teams and Green Corps members are active participants in maintaining the Richmond Greenway and greening the city through urban forestry. Through its work on the Richmond Greenway and as the city’s Urban Forestry Administrator, Groundwork Richmond is making a difference in an area that faces many environmental and social challenges. Through partnerships, education, and workforce development, the Trust has helped to build a community that is actively engaged in making its environment healthier and safer. Groundwork Richmond has also created opportunities for Richmond youth to invest in their environment as well as their futures. Given the social, economic and environmental problems present in Richmond, California, Groundwork Richmond is acutely aware of environmental justice issues in the communities where they work. As part of their regular programming, they educate students and residents about environmental justice using history, current events, and Mayah’s Lot, a graphic novel that encourages environmental awareness and civic engagement. This work grew into a national environmental justice curriculum. First developed by Groundwork Richmond and further refined by Groundwork USA staff and several other Groundwork trusts, a new resource was created: Learners to Leaders: Environmental Justice Literacy Curriculum. The curriculum provides a history of environmental justice, looks at the intersection between environmental and civil rights movements in America, and connects students to current events in their own communities. 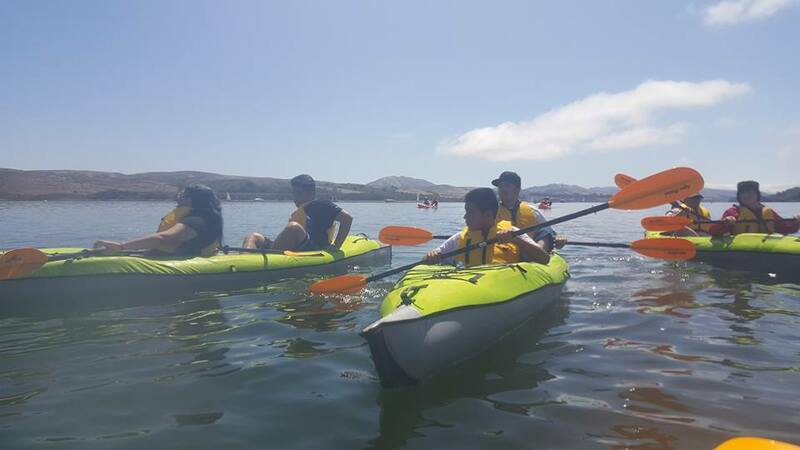 In 2018, activities from the curriculum were implemented at workshops at the National Environmental Justice Conference and Training and at River Rally. To further develop the curriculum, Groundwork USA staff incorporated feedback from workshop participants and over 50 Green Team students around the United States. The curriculum is adaptable to learners of middle school age and above and can be completed in many different settings. The resource is readily available, and Groundwork USA is encouraging urban waters practitioners to use it in their own communities. If you are interested in being part of further testing Learners to Leaders, please fill out this form or contact maria@groundworkusa.org. The mission of Groundwork Richmond is to bring about the sustained regeneration, improvement, and management of the physical environment by developing community-based partnerships which empower people, businesses, and organizations to promote environmental, economic, and social well-being.